With the Northeast preparing for the arrival of Pope Francis, the Philadelphia Phillies are kicking things off early with a specific card for the popular pope. The simple card is part of a giveaway for the September 16 tilt against the Washington Nationals. Part of a larger visit to the country, the Pope will visit Washington, D.C. and New York City in addition to his stop in Philadelphia. 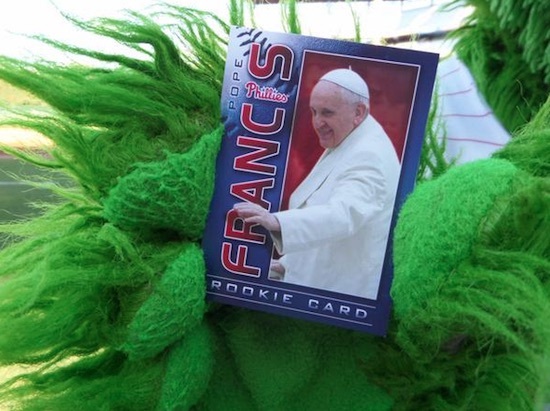 Fans can obtain the Phillies-themed Pope Francis at the First Base and Third Base Kiosks. The Phillies first debuted the card on their Twitter account being held by the Phillie Phanatic. Although he is the leader of the Catholic religion, the pope is a symbol for many around the world and this card will likely receive good interest from both collectors and non-collectors. The giveaway number was not provided, so the rarity is not currently known. While they will likely be plentiful, because they are so simple, only a limited amount may make it online. The full front and back image was provided in a video from ABC6 News in Philadelphia. 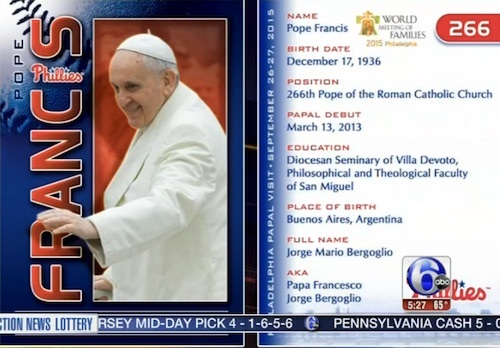 In addition to his basic info, the card is number 266 in honor of his spot in the chronological order of popes. It also notes his Papal Debut and Position. While it includes a "Rookie Card" notation on the front, this is not the first card for Pope Francis. 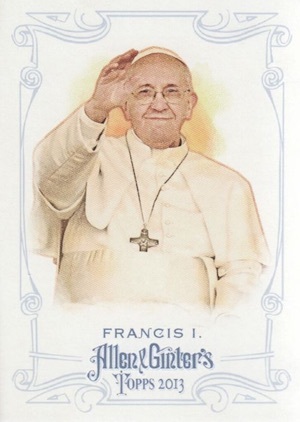 Collectors can also check out 2013 Allen & Ginter, which features an earlier card for his holiness. There are also several levels of mini parallels in the 2013 set and stamped buybacks of the cards are available in 2015 Allen & Ginter.